From within the deepest, darkest recesses of Heddy's UFO basket come (dum-dum- dummmm) ... the long anticipated, often discussed but rarely seen, but never far from her thoughts ... Twister Socks! I am so happy to finally have these socks off the 2.5 mm Pony Pearls and even happier to get rid of the zip lock baggie they have lived in for ... (wait for it)... (dramatic pause) ... nearly 2 years! Yes, it is true! T bought me this yarn in 2007, and I cast on on August 24th, 2007 with the hopes of making a gift for someone in the family for Christmas ... it didn't happen (at least not that year)! Anyhow, a week or so ago, on Monday, I picked these socks up again, realizing I had made it to halfway through the EOP heel of the second sock, and that to have a FO wasn't going to be a big job. 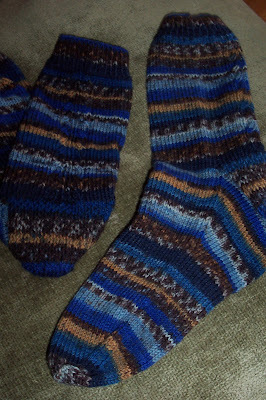 I cast off and kitchenered the toe at knitnight last week ... done in less than 2 evenings of knitting! 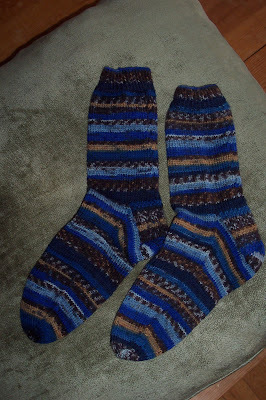 The socks are called Twister for the twin cables (mirrored - thanks for the term, Donna M.!) that go up the back of each leg, separated by a twisted rib. The socks are a basic recipe -- cast on 64, 1 x 1 twisted rib for a few inches, then the 4 x 4 cables and twisted ribbing on either side and separating the cables, an EOP heel and the standard gusset decreases. The yarn is Drops Fabel and I can't say what colour - hey! these socks were started in 2007 - I am lucky to have even found the socks, let alone the ball band :) I knit them on 2.5 mm Pony Pearl dpns, and they are about a ladies size 7. I am going to give them as a Christmas gift (which was what they were intended for way, way back in time when I started them).